Moore also noted that the U.S. is building an even larger drone base in Agadez, Niger. “Certainly, for people living in Somalia, Niger, and Djibouti, the notion that the U.S. is not militarizing their countries rings false,” he added. For the last 10 years, AFRICOM has not only sought to define its presence as limited in scope, but its military outposts as small, temporary, and little more than local bases where Americans are tenants. For instance, this is how Waldhauser described a low-profile drone outpost in Tunisia last year: “And it’s not our base, it’s the Tunisians’ base.” On a visit to a U.S. facility in Senegal this summer, the AFRICOM chief took pains to emphasize that the U.S. had no intension of establishing a permanent base there. Still, there’s no denying the scope of AFRICOM’s network of outposts, nor the growth in infrastructure. Air Forces Africa alone, the command’s air component, has recently completed or is currently working on nearly 30 construction projects across four countries in Africa. “The U.S. footprint on the African continent has grown markedly over the last decade to promote U.S. security interests on the continent,” Navy Cmdr. Candice Tresch, a Pentagon spokesperson, told The Intercept. While troops and outposts periodically come and go from the continent, and some locations used by commandos conducting sensitive missions are likely kept under wraps, Teil’s map represents the most current and complete accounting available and indicates the areas of the continent of greatest concern to Africa Command. “The distribution of bases suggests that the U.S. military is organized around three counter-terrorism theaters in Africa: the Horn of Africa — Somalia, Djibouti, Kenya; Libya; and the Sahel — Cameroon, Chad, Niger, Mali, Burkina Faso,” says Moore, noting that the U.S. has only one base in the south of the continent and has scaled back engagement in Central Africa in recent years. Officially, a CSL is neither “a U.S. facility or base.” It is, according to the military, “simply a location that, when needed and with the permission of the partner country, can be used by U.S. personnel to support a wide range of contingencies.” The sheer dimensions, cost, and importance of Agadez seems to suggest otherwise. “Judging by its size and the infrastructure investments to date, Agadez more resembles massive bases that the military created in Iraq and Afghanistan than a small, unobtrusive, ‘lily pad,’” says Moore. The U.S. military presence in Niger gained widespread exposure last year when an October 4 ambush by ISIS in the Greater Sahara near the Mali border killed four U.S. soldiers, including Green Berets, and wounded two others. A Pentagon investigation into the attack shed additional light on other key U.S. military sites in Niger including Ouallam and Arlit, where Special Operations forces (SOF) deployed in 2017, and Maradi, where SOF were sent in 2016. Arlit also appeared as a proposed contingency location in a formerly secret 2015 AFRICOM posture plan obtained by The Intercept. Ouallam, which was listed in contracting documents brought to light by The Intercept last year, was the site of an SOF effort to train and equip a Nigerian counterterrorism company as well as another effort to conduct operations with other local units. Contracting documents from 2017 also noted the need for 4,400 gallons per month of gasoline, 1,100 gallons per month of diesel fuel, and 6,000 gallons of aviation turbine fuel to be delivered, every 90 days, to a “military installation” in Dirkou. Africa Command’s map also shows a contingency location in neighboring Tunisia, possibly Sidi Ahmed Air Base, a key regional U.S. drone outpost that has played an important role in air strikes in Libya in recent years. Djibouti is home to the crown jewel of U.S. bases on the continent, Camp Lemonnier, a former French Foreign Legion outpost and AFRICOM’s lone forward operating site on the continent. A longtime hub for counterterrorism operations in Yemen and Somalia and the home of Combined Joint Task Force-Horn of Africa (CJTF–HOA), Camp Lemonnier hosts around 4,000 U.S. and allied personnel, and, according to Teil, is the “main platform” for U.S. crisis response forces in Africa. Since 2002, the base has expanded from 88 acres to nearly 600 acres and spun off a satellite outpost — a cooperative security location 10 kilometers to the southwest, where drone operations in the country were relocated in 2013. Chabelley Airfieldhas gone on to serve as an integral base for missions in Somalia and Yemen as well as the drone war against the Islamic State in Iraq and Syria. “United States military personnel remain deployed to Djibouti, including for purposes of posturing for counterterrorism and counter-piracy operations in the vicinity of the Horn of Africa and the Arabian Peninsula, and to provide contingency support for embassy security augmentation in East Africa,” President Donald Trump noted in June. In Gabon, a cooperative security location exists in Libreville. Last year, U.S. troops carried out an exercise there to test their ability to turn the Libreville CSL into a forward command post to facilitate an influx of a large number of forces. A CSL can also be found in Accra, Ghana, and another CSL is located on a small compound at Captain Andalla Cissé Air Base in Dakar, Senegal. “This location is very important to us because it helps mitigate the time and space on the continent the size of Africa,” said AFRICOM commander Waldhauser while visiting the Senegalese capital earlier this year. In May, responding to questions about measures taken after the October 2017 ambush in Niger, Waldhauser spoke of fortifying the U.S. presence on the continent. “We have increased, which I won’t go into details here, but we have increased the firepower, we’ve increased the ISR [intelligence surveillance and reconnaissance] capacity, we’ve increased various response times,” he said. “So we have beefed up a lot of things posture-wise with regard to these forces.” This firepower includes drones. 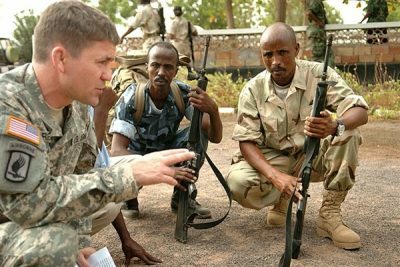 “We have been arming out of Niger, and we’ll use that as appropriate,” Waldhauser noted this summer, alluding to the presence of armed remotely piloted aircraft, or RPAs, now based there. “The proliferation of bases in the Sahel, Libya, and Horn of Africa suggests that AFRICOM’s counterterrorism missions in those regions of the continent will continue indefinitely,” Moore told The Intercept. Hours after Moore made those comments, the Pentagon announced that six firms had been named under a potential five-year, $240 million contract for design and construction services for naval facilities in Africa, beginning with the expansion of the tarmac at Camp Lemonnier in Djibouti.